hello Christine, how thick should the 'skin' be? Many thanks. Mine was about 0.5cm. Some people like to have thinner skins, some don't. It doesn't matter, as long as you like it. 這麵團會發酵發大至兩倍嗎?就好似麵包食譜? Sorry I never make bread before! 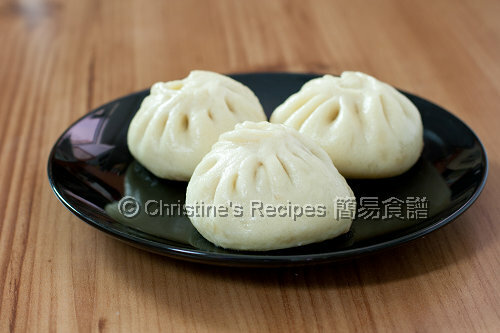 Would you give us a recipe for plain Chinese buns (they call it "Man Tou"). I bought some ready mix from Chinese grocery store the other day but do not like it. 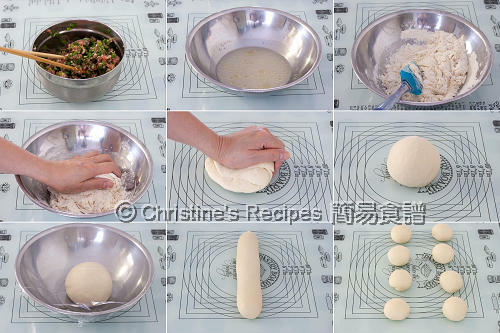 Haven't tried making mantou yet. If I've done, will share on this blot. 1) should I mix the yeast in warm/cold/room temperature water? 2) is the flour you used all-purpose white flour? Any special flour needed? If you use instant dry yeast, it can be mixed in with other ingredients directly as long as it's still effective. Follow the steps in this recipe. It'll do. But if you want to activate it first, it's ok. Simply warm up the water (below 40C), called for the recipe, and mix with the yeast. No need to get any special flour. I used unbleached all purpose flour because it's more natural. I don't mind its yellowish colour. Thanks for sharing this great recipe! Can I please ask you two questions? 1) should I mix the yeast in cold/warm/room temperature water? 2) should I use all-purpose white flour? Any special flour needed? Thanks lots =] Happy New Year!